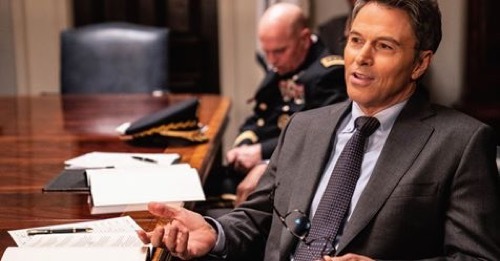 Tonight on CBS Madam Secretary airs with an all-new Sunday, January 27, 2019, season 5 episode 13 called, “Proxy War,” and we have your Madam Secretary recap below. On tonight’s Madam Secretary season 5 episode 13, as per the CBS synopsis, “Innocent Syrian children are killed by an American-made cluster bomb, and Elizabeth races to figure out what went wrong before Russia can use it as an excuse to escalate its military presence in the region. The Secretary of State was facing an international crisis. Secretary McCord had learned that the bomb that massacred twenty-nine innocent children in Syria was in fact created by the United States. It was called a cluster bomb and the only ones that the US had ever sold them to were Israel. Otherwise known as their strongest ally in the Middle East. Israel couldn’t be seen to have played a part in the tragedy and so the secretary tried to reach out to the Israeli ambassador. She had her people call his office, she left messages, and she tried to issue a statement expressing sadness without any guilt. But somehow the news got out. There had been Americans that took the street in protest over what happened and everyone seemed to personally blame the administration. Russell Jackson who was known worldwide as the Chief of the President’s Staff was accosted on his way to work. He was stopped by a group of protestors and one of them had gotten into Russell’s face. He found himself corned and so he just reacted. Russell called the woman a crackpot that chased after conspiracy theories and unfortunately, someone recorded his impressive takedown. It was later posted online and basically become the face of US response. Russell came across as callous and it didn’t seem like he cared about what happened to those kids because he had to make sacrifices for foreign policy. It was out of context and it made an already fraught situation that much worse. Secretary McCord’s office had reached out to the mothers that were now forced to bury their children and they tried to keep things at simply expressing their sympathies, but the mothers demanded something that matters. They demanded justice for their children and refused to be moved on the subject. They were hurt and they were and they were grieving, only they hadn’t been wrong. They deserved justice and so the United States decided to do something. They finally reached the Israeli ambassador and they asked him about the bombs. He, of course, denied any part in the cluster bomb and claimed that Israel was framed. He was so sure about this that he kicked up a fuss when the United States said that they will not be selling any more of those bombs to them. McCord wanted to hold off on all sale until an investigation was carried out and that infuriated the ambassador. He said and it was clear that he believed it – Israel would be overrun by Iran if they could no longer count on their most trusted ally. The ambassador raised a point and it was that they had no reason to bomb Syria. Syria was their enemy which was true but to bomb it with someone that could be traced back to them didn’t make sense and neither did the place that was hit. Those children died in Aleppo and were in the allied section far away from Assad’s regime. It would make no sense for Israel to target them and the ambassador was soon proven right about his government’s involved because Israel really didn’t have anything to do with it. The secretary had been in the Situation Room when she watched footage from satellites and noticed that the plane that dropped the bomb was Russian. It was a Russian plane and it left Assad’s airfields. McCord and everyone in that room at the time had believed that Russia working with Assad’s regime had killed those children in order to frame Israel. They knew that if Israel went down then so did their allies. McCord informed her president and then she went to the Syrian ambassador. She threatened to cripple them with even more sanctions if they didn’t confess to what they did and they retaliated by telling her that their relationship with Russia meant Russia would soon provide them with better military weapons. It seemed like a draw, but then Syria accidentally bombed a Russian plan and the death of those Russians made everyone fear that Russia would then attack their former ally. But the Russians weren’t blaming Syria. They said that an Israeli plane had followed their plane until a bomb was launched and then quickly left Russia to be the one to get hit. The Israelis were confronted by this and they willing admit that they had set the Russians up to be bombed. They technically followed the rules by stating that they had planes in the air and their flight pattern, so they weren’t entirely wrong. It’s just the way they went about it and how they believe that if Russia was giving Syria weapons that the US should give them weapons as well. Everyone involved seemed unreasonable and it didn’t help when the United States learned how Russia was able to duplicate one of their bombs. It hadn’t been because anyone was dirty at the manufacturer’s but it had been their lackadaisical security. They cut down on cost by risking their computer security and so that’s how someone was able to duplicate one of their bombs to the exact measurements. The only thing that reassured the United States had been the Russian alloy found in the bomb that killed those children. That at least told them that it couldn’t have been anything they did! They also came to learn why the Russians and Syrians did what they did. They both wanted a Mediterranean Naval Base and they were willing to use dead children to get them. There was just one problem with this plan. No one thought Israel would retaliate! It was the retaliation that forced Russia to once again rely on extreme tactics and after a bomb killed their citizens they were willing to get into direct conflict with the United States. Both countries called on their navies to create a response in the Med and so Secretary used this to scaring both Syria and Israel into backing down. Israel couldn’t fly into Syria anymore and Syria could allow for weapons meant for Iran to pass through their borders. The ambassadors had all been shocked into submission and so a different kind of war was averted. And the office of the secretary even told those grieving parents that cluster bombs had been banned in Syria which means no other mothers would ever have to face the loss they were going through.